Gye Nyame, the Adinkra symbol that hails God's supremacy appears in a design from Issaka Ibrahim. 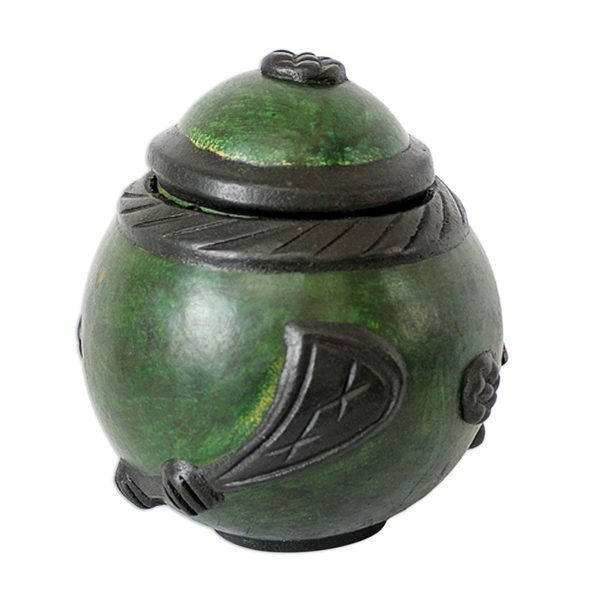 Featuring a sword too, the images are sculpted with powdered charcoal and adhered to a dried calabash, transforming it into an extraordinary decorative box. I was born in Accra on August 4, 1974, but learned my art in Aburi in the Eastern Region of Ghana. I was taught by Mr. Masawudu. Because I had no sponsorship, I decided to learn to craft masks to earn a living. I work with wood, aluminum, copper, calabash and aluminum; my tools are hammers, chisels, nails, white glue, polish and such. I like to keep busy and find motivation in educating others about art. In fact, I have taught the craft to others. Although my work has been exhibited in hotels and is prized by my clients, my greatest challenges in life have been financial, and also promoting my art. I am married, and we have two children. I feel my works are very unique and beautiful, and this has not changed. My dream is to become known as an artist. It's wonderful to work with Novica, and I want you to know I will create my best designs for you.